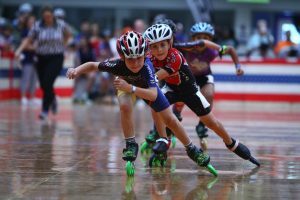 Teaching kids to skate can be tricky, but with a little patience and these tips, even young children can learn to skate! Start Small – Give your child short, easily digestible lessons and goals that they can master. Teaching a child how to safely fall, get up, and stand on skates is a good place to start. Don’t Hold their Hand – While skating, we use our arms and hands to help keep balance. Holding a child’s hand doesn’t allow them to learn how to balance because their hand and arm are engaged. As much as you want to hold them up, it’s best to let them stand on their own (so long as they are in a safe place to do so). Stand up Straight – The best way to learn to balance while standing still is with your hips, shoulders, and head all arranged in a straight line above your skates. Leaning forward or backward will make your child roll, so start with standing. Of course, the best way to teach kids to skate is by taking them to our Deer Park skating lessons! Our Beginner’s Skating Lessons are designed specifically for 5-12 years old, and they are held on Tuesdays from 6:00 p.m. – 7:00 p.m. The classes teach basic skating skills such as how to stand, fall, move forward, skate backwards, stop, and turn. We even have games to help keep the little one’s attention. The lessons are $90 for five 45 min lessons (skate rentals are an additional $15). The lessons include two free passes to Skate World (for practice) and a certificate of completion on last day of class if your child has mastered all the steps. If your child does better one-on-one, we also offer Private Beginner’s Skating Lessons. Private lessons are $30 for 45 minutes and an additional $10 for each additional skater (up to a maximum of 4). For more information about our children’s skating lessons or to schedule a lesson for your child, email Morgan.Malone@skateworlds.com.